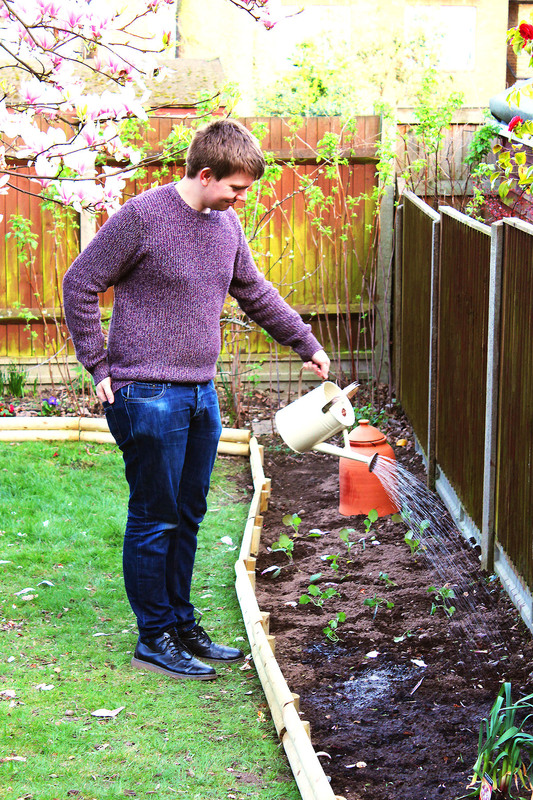 Looking to grow your own fruits and veggies in the comfort of your back garden? Then you’ve come to the right place! 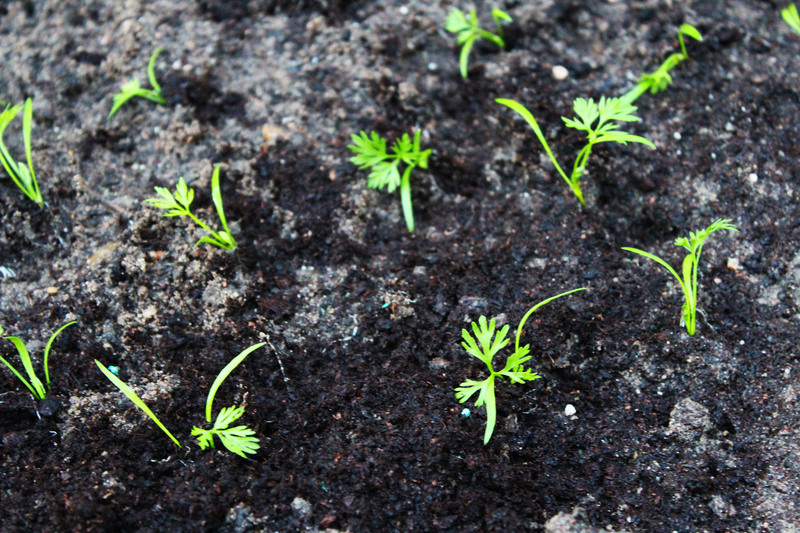 In this series I’m going to share advice on how you can create a kitchen garden from scratch. I’ll also give you a glimpse into our own progress. If you haven’t read my first post on planning and preparation for a kitchen garden make sure you check it out here. Having gone through the planning stages ourselves, Jon and I booked some time off at the end of March so that we (almost) had a full three days to put our kitchen garden plans in to action. Here’s how we got on. Before we did anything on that first Friday morning we went out to assess the area. Although we’ve been in the house for over 6 months now we’ve barely spent time outside. The plan for the weekend was to clear the entire right hand side of the garden and dig a new bed which would be used to plant our spring crops. We’d then lay some edging and finish off with a couple of potted plants. Here’s the obligatory before shot. Sounds simple right? Well we were in for a few surprises…but more about those later! Having measured up and taken stock of the tools we already had, we headed off to Crews Hill to shop! For those of you who don’t know, Crews Hill is a village in Enfield made up almost ENTIRELY of garden centres. Each one has their own niche – from indoor plants, to sheds, water features, to fake grass. If you want it, someone in Crews Hill is selling it! We came out of the garden centre £150 lighter having invested in a garden fork, secateurs, compost and seedlings. We chose not to grow from seed to start with as there’s a lower success rate and we wanted to give ourselves the best possible chance of getting some fruit and vegetables later this year! 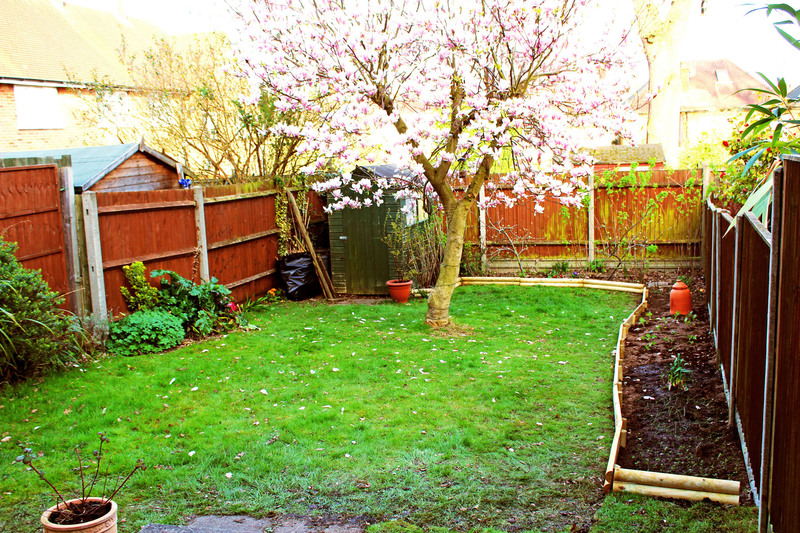 As you can see from the “before” photo further up this post, the garden we’d inherited was already pretty established. There were a number of large bushes, no real flower beds which we could adopt and use for our vegetables and the end of the garden was…well…just a mess. Although this small section of patio came as a pleasant surprise, we also had the not so pleasant surprise of invasive bamboo roots. We must have spent HOURS digging away at those roots. I get fixated on these things and once I’d discovered the root network I had to get them all up. By this point it was getting pretty late and we’d been in the garden for a good 5 hours. Jon took a break and I sliced turf away from the edge of the garden to create a bed. Some of the turf was relayed around the paving slabs we’d uncovered. It’s a bit of a patchwork but some grass seed will sort that in no time! On the Saturday Jon was off at a brewing course and so I had the garden to myself. I turned on the radio and decided to tackle the mess at the end of the garden. The previous owners had planted raspberry canes, two apple trees and what we believe are a couple of blackberry bushes (only time will tell). The whole area was completely overgrown so I got stuck in digging up some of the new, unwanted raspberry cane shoots, pulling out all of the dead canes and removing random planks of wood and paving slabs. The whole area still needs a good weed and once they have all produced fruit this year we’ll have another think about trimming them all back further. I was amazed at just how much dead raspberry cane I managed to get out. For now it’s all bagged up to go on a fire pit later in the summer. Towards the afternoon on Saturday I went back to the new bed I’d dug the day before. I weeded, turned it over with a fork, removed some random roots and stones, then added some multipurpose compost as well as a bag or two of John Innes No.2 which is good for small vegetable seedlings. I then carefully laid out all of my plants, making sure I would have enough room between each before I started planting. My Mum and Dad had bought me a small gooseberry bush for my birthday and this got planted towards the end of the bed nearest the other, already established fruit bushes. Next was the rhubarb (this time a present from Jon on international Women’s Day). I’ll admit we didn’t quite get it in the ground quick enough and it’s been looking a little sorry for itself! Hopefully now the weather has cheered up it will start looking a bit happier. Further up the bed I planted brussell sprouts, broccoli, garlic, beetroot, leeks and carrots. The garlic will be ready to harvest in May but the brussell sprouts will be the last ones to be harvested, at which point I hope the other side of the garden will also be in bloom. I’ve always enjoyed getting a bit messy and planting the little seedlings was one of the most relaxing parts of the weekend. Because the seedlings are so delicate I find it easiest to plant with my bare hands so ended up rather muddy! By the end the temperature had dropped as the sun had started to go down and a hot bath was in order. Although there was nothing wrong with leaving the edge of the bed as it was, I was keen to add some edging to really finish it off. Log roll is a popular (and cheap) choice but I wanted something a little different. Railway sleepers although beautiful are mega expensive (and wouldn’t fit in Jon’s car!) Instead we went for horizontal log edging. Stacked two high I think they create a nice border! When the plants are a little bigger and more well established I think it will look really good. We also added a few pot plants that my parents had been looking after until we got a garden. A blueberry bush is now next to the shed and a tayberry bush is in a pot next to the steps. We also planted a few strawberry plants which will also live in a pot on the patio. I’m so proud of how much progress we’ve made in just the one weekend. I can’t wait to spend more time out there and see our plants grow! For now here’s the “after” shot from the weekend. I think it’s fair to say the transformation has already been pretty radical. Now that rosemary bush has gone the garden looks so much bigger! We will keepwatering our new plants (and the new grass seed) but we don’t intend to do any major digging or planting over the next few months. In the next few weeks I will be ordering a set of ladder shelves to place on the patio. These will be stacked with herbs right next to the back door for picking as and when needed. In the more immediate future I’ll be adding lights to our magnolia tree, ordering a table and chairs set and installing our BBQ! 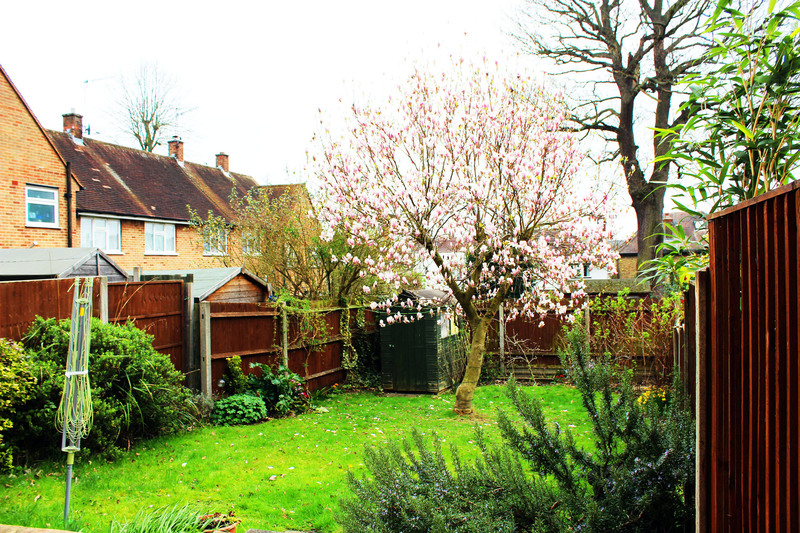 We have friends and family over at the end of April and it would be lovely to spend some time sitting out in the garden if the weather is good enough. As soon as we’ve made some more progress I’ll make sure I share some photos. In the meantime why not follow me on twitter and Instagram to get frequent updates. 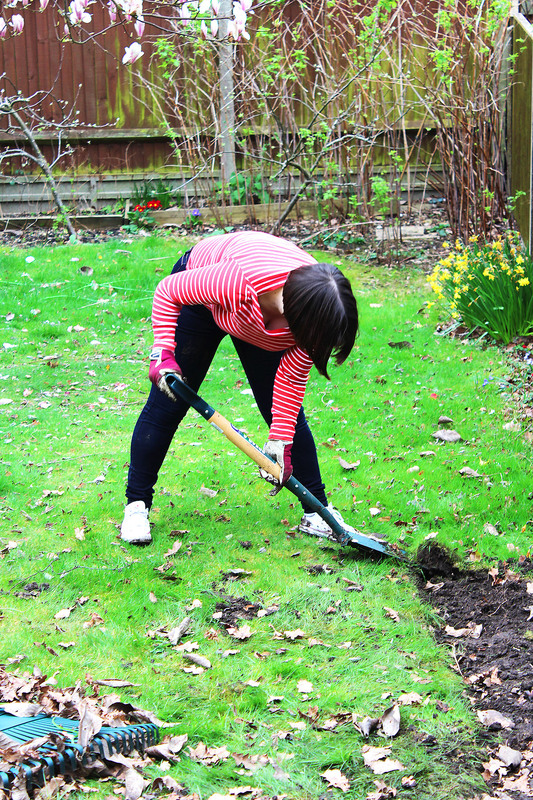 Are you planning a spot of gardening this spring? If you’re enjoying this series please do pin it for later! Well done both of you! I bet you were sore after that, it’s a tough job starting a garden but exciting to start growing your own veg. Thanks Janice! I’ve been lucky that in the past most of the hard work has been done for me and its just a case of popping some plants in the ground! Turns out I’m quite good at lifting turf 😛 who knew! Well done, that’s a decent amount of work you managed to fit in. It’s very exciting growing a bit of your own food, so I hope it all works out for you. Thanks Choclette! Some plants are doing better than others so far. Looks like we are going to have Brussels and carrots in abundance which is good for roasts! broccoli is being pecked to death by pigeons but we’ve invested in some netting which should help keep them away! Wow what a change! I had to scroll back up to your before photo to see how much. We lost our greenhouse over winter to the weather so I’m really behind with our veggies. Going to have to get some in soon or it will be too late! I’ll keep my fingers crossed for you Andrea! I missed growing my own so much when we were in the flat!